Many consider Evangeline Hamilton cursed. 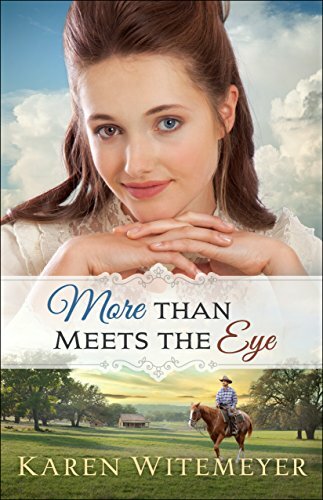 Orphaned at a young age and possessing a pair of mismatched eyes--one bright blue, the other dark brown--Eva has fought to find her way in a world that constantly rejects her. Yet the support of even one person can help overcome the world's judgments, and Eva has two--Seth and Zach, two former orphans she now counts as brothers. Seeking justice against the man who stole his birthright and destroyed his family, Logan Fowler arrives in 1880s Pecan Gap, Texas, to confront Zach Hamilton, the hardened criminal responsible for his father's death. Only instead of finding a solitary ruthless gambler, he discovers a man not much older than himself with an unusual family. When Zach's sister, Evangeline, insists on dousing Logan with sunshine every time their paths cross, Logan finds his quest completely derailed. Who is truly responsible for his lost legacy, and will restoring the past satisfy if it means forfeiting a future with Evangeline? I enjoyed reading More than Meets the Eye, book one of Karen Witemeyer's new series called A Patchwork Family. Evangeline is an ideal heroine. With her mismatched eyes she could have been bitter and unforgiving to those who ridiculed her yet she was the complete opposite. I admired her for her openness and kindness; just they type of gal you'd want for a friend. When she met Logan it was her good nature that disarmed all his defenses. He found out that this sheltered young woman was no match for any designs he might have on her for his plans. While Evangeline and Logan's story is at the heart of this book I have a soft spot for Zach, Eva's oldest brother. He had such a hard shell around his heart created by difficult circumstances. He'd had to grow up quickly after the Orphan train crashed. He could have escaped on his own but quickly decided to stand by and protect two younger orphans who survived with him. In one moment he went from being a teen with a chip on his shoulder to creating and providing for a new family. A Patchwork Family he never let down. This is a wonderful story of resilience, forgiveness and love. Not just the romantic love but a love story of families who grew out of need in the wild west of old. Karen Witemeyer is noted for her wonderful stories emanating from the wild west and for that I am pleased. I enjoy a peek at what life may have been like for those who helped build this great western piece of our country. Comments are connections between online friends! What Could Be Better than A Christmas by the Sea!